President Trump has doomed the earth to extinction! We have all heard some variation of that chicken-little headline because President Trump has directed the EPA to roll back former President Obama’s hugely expensive Clean Power Plan. Well, yesterday Investor’s Business Daily posted an article about the impact of President Trump’s directive. 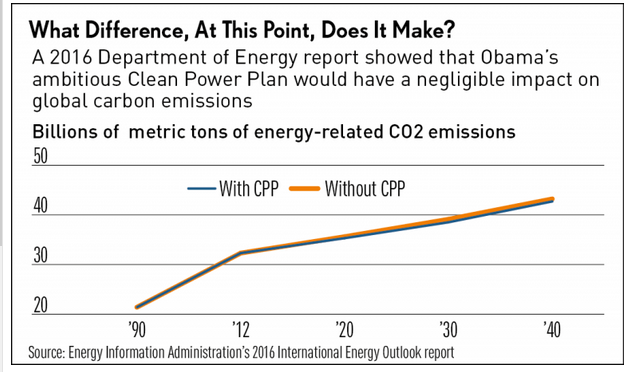 Take a look at the Clean Power Plan — Obama’s most ambitious climate change effort. Despite the costs of this regulatory monstrosity, the Clean Power Plan would have no discernible impact in global carbon dioxide emissions over the next three decades. That’s not the conclusion of climate change “deniers.” That’s what the Obama administration’s own Department of Energy said in a report issued in May 2016. As part of its International Energy Outlook, the Energy Information Administration provided long-term forecasts of energy-related CO2 emissions, comparing global emissions with the Clean Power Plan, and without it. What it shows is that with the Clean Power Plan, global carbon emissions would still climb 32% in 2012 and 2040, only slightly below what the increase will be without it. So why did we cripple our domestic energy production and put thousands of people out of work? Rush Limbaugh has commented many times that the environmental movement is the new home for the socialists and communists of the world. As countries with basic freedoms have become more prosperous, countries that do not have basic property rights have become poorer. Those poorer countries would very much like to find a way to extort money from the richer countries. That is exactly what a worldwide carbon tax would do. How do you implement a worldwide carbon tax? You convince people that wealthy nations are ruining the earth and need to pay a price for it, and you give the money to the tyrants of the world. Please understand, I am not in favor of pollution. However, I am in favor of balancing the economy and the environment. As we noted in this space recently, without any government mandates, energy-related CO2 emissions in the U.S. fell 12.4% from 2007 to 2015. Overall carbon intensity — a measure of how much CO2 it takes to produce a dollar of GDP — declined an average 1.5% a year since 2005. These gains are due both to the fracking breakthrough, which unleashed massive supplies of lower-carbon natural gas, and the unending pressure the free market puts on businesses to be more efficient. This same market-driven decarbonizing trend has been happening around the world. Between 1990 and 2012, the carbon intensity of developed nations dropped by 33%, and by 25% in developing countries. By 2040, the carbon intensity of developed nations will be cut in half, the report projects, and will drop by almost 40% in developed countries, the Energy Department report shows. Yet overall energy-related CO2 emissions will still climb by 51% in developing countries, and 8% among industrialized nations, from 2012 to 2040 — even with the Paris agreement. Why? “Increases in output per capita coupled with population growth overwhelm improvements in energy intensity and carbon intensity,” the report explains. In other words, barring some miracle scientific breakthrough, the only reliable way to cut global carbon emissions would be to depopulate the planet or kill economic growth. The global warming panic is nothing more than a stealth attack on our economy and freedom. As I have stated before, the best site on the Internet for good, scientific information on climate change is wattsupwiththat.com. I strongly recommend that you visit the site when you wonder about the scientific accuracy of whatever current panic attack the environmentalists are having. This entry was posted in Uncategorized and tagged Barack Obama, Clean Power Plan, Climate change, Donald Trump, Executive Order, Global warming, United States, United States Environmental Protection Agency, WattsUpWithThat.com by granny g. Bookmark the permalink.